Once the account is created, there is some data that can be modified based on your preferred format settings. Currency Symbol: The default currency symbol is &apos;$&apos;, but you can select your own symbol by typing it in the box below. 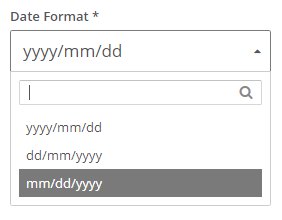 Where can I change the format settings? To change the format settings, simply navigate to Configuration > Advanced and there you&apos;ll be able to change them. Keep in mind that only the users that have the Administrator role will have access to the account configuration.